Avengers-Land Mission Two Now Assembling! Do you have what it takes to be a member of Team Hero, Sidekick, Villain, or Civillian, and lead your team to victory? Do you like graphics, fanfiction, and puzzles? A land comm for Marvel's The Avengers movie on LiveJournal. Mission Two starts Tuesday, Sept. 4! Seriously, guys, I can't recommend this comm enough. It's a friendly, great group of people, the challenges are tons of fun, and it doesn't really take up that much time. Plus, you get to hang out with lots of cool peeps who love The Avengers as much as you do. It's win-win-win! The next mission starts tomorrow, but you don't have to be signed up by then if you want to take some time to think about it. I'm on Team Sidekicks and we're awesome. Come play with us! 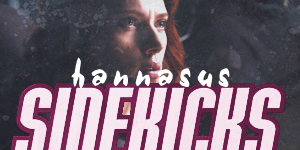 And speaking of, I forgot to post my banners from the last mission (which Team Sidekicks totally rocked).